A personal identification method and system for improving personal hygiene in which provision is made for identifying a beverage, food product, or the like, with a particular person so that another person does not inadvertently access the identified item unintentionally. Identifying indicia such as numbers or alphabetical letters are selectable and conditioned by the user to be prominently displayed on the item so as to identify it with the individual involved. For necked beverage containers, in one embodiment, a re-usable snap-on display device, or assembly, is configured to snap onto the neck of the container in another embodiment, the existing conventional cap-attaching ring is modified to include alpha-numeric indicia and/or to receive a cooperating indicia-indicating display element. For beverage cans, a wandl-like element portraying selectable alpha-numeric indicia is attached to the conventional snap ring opener and for boxed beverages, a plurality of selectable identifying apertures are provided so that the user can personally distinguish his or her beverage from those of others. Simply attend a two-year-old's birthday party and you'll see where the idea was born for the Cootie-Stopper(TM) brand of patented identification methods and systems. how each child's nose could produce its own unique shade of green! Yuck! With the world getting smaller, the parties bigger and Viruses Stronger I figured it was time to address this problem and provide children, and adults alike, a method by which they may readily and reliably identify whose beverage is whose. Cootie-Stopper(TM) concept quickly expanded to include bottle caps and cup lids. This patent applies to the $6.5 Billion U.S. Dollar bottle cap industry. I would like to move/sell this patent in any way possible for a bargain price. See cootiestopper.com for more details and additional patent offerings. 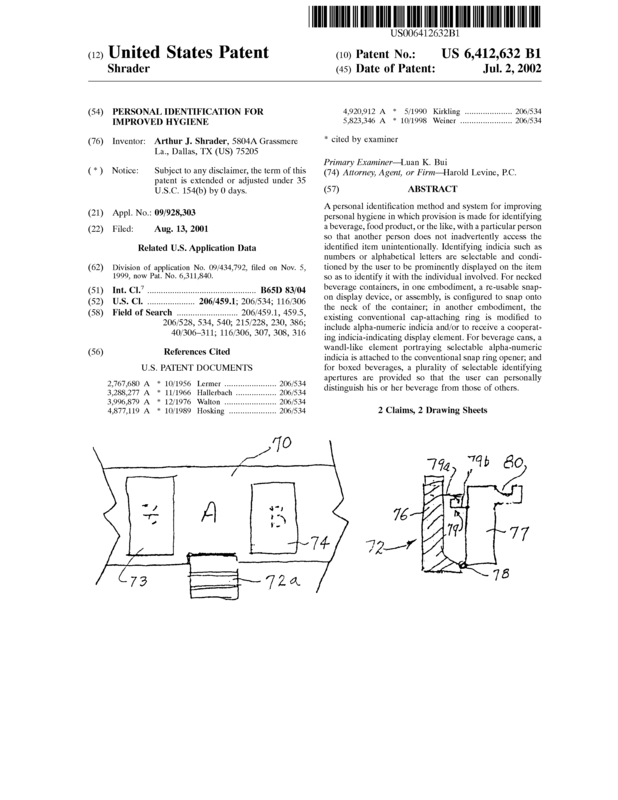 Page created at 2019-04-22 14:07:52, Patent Auction Time.